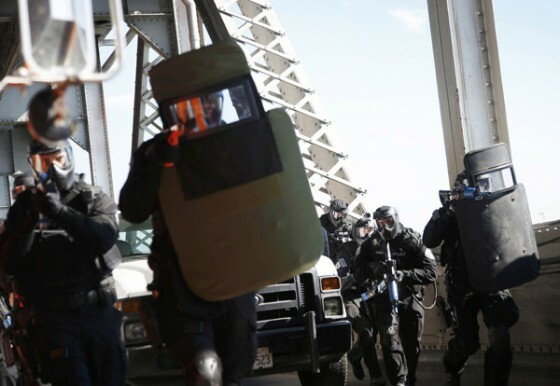 While at a wedding rehearsal last week, I received a call from my editor to cover Urban Shield, a large-scale, 48-hour preparedness exercise for first responders. With participants and observers attending from various states and countries, Urban Shield is in a sense the Super Bowl of preparedness exercise. I knew I wanted to document the event when I heard that parts of it will be held at the recently closed eastern span of the former San Francisco-Oakland Bay Bridge. Read on for the full story and lots more pics. Damn I think I played this exact scene in one of the Modern Warfare games.